Uncanny prediction. Based on the following pictures, we might be inclined to agree. (P.S. I’ve been informed Snopes says he didn’t say this) Still, a ponderable quote -smile. How about a day at the beach? Dinner with family and friends? Egads! Does anyone else see themselves here? I have a sweet son, who is learning how to engage with the human race. It has been hard for him. He is a Millenial, raised on technology. It’s so difficult for young people to stay connected in a real way. You may not know this about me, but I am really, truly shy. Internally, I agonize over interacting with the human race. If someone has a child or a dog, I zero in on them and then the rest happen as it may. Have you ever seen others do that? They go for the dog? I was lucky though. I did not have technology to hide behind. I had a stage mom who forced me into modeling and putting me into charm school. Do they even have those anymore? I learned how to walk, talk, dress and smile. Yup! It wasn’t easy, but I learned. She then poked and prodded for me to enter beauty contests and finally land my first real job as a flight attendant. A glamorous, glib, flight attendant!!! Talk about scary. In those days we didn’t have recorded devices to give you emergency information. We actually had to memorize and make these announcements ourselves. My first PA was ghastly. I’ll never forget seeing my training stew running up the aisle to quickly inform me to lower my voice a few notches so I wouldn’t panic the passengers. I was shaking like a leaf. Before long, I was practically performing skits to entertain passengers, especially on delayed trips, or fog outs/ins. I was forced to engage. Kids today are generally really not stupid, though. They just don’t know how to interact. I have noticed that young people have difficulty either relating to adults or to their peers. They are seldom strong in both. I’ve seen teens and young people who just cannot engage with or be in the presence of an adult without looking like they are about to leap out of their own skin! I know my son, does well with adults and children, but is terrified of his peers. I know some of that is because he has ADD and was bullied in school, but it has not gone away. It still haunts him. He says, he wants to be more like me. I gave him my tricks. For parties, I arrive early and get busy helping. This way people come in one at a time and it’s less scary. Take a pal with you, someone to talk to. They don’t have to know you are using them as a crutch. Check out the room, there is usually someone there as nervous as you. Go to that person and engage them in conversation. If they are unresponsive, because that is often the case, move on. When doing this becomes a habit, you no longer think of how frightened you are. These days, even though I’m married, I do most things alone. He’s not into theater, movies and the like, so I go alone to go at all. Those I know that do, live far away from me. I’m actually surprised at how many people I know, especially in California who don’t care for the arts. When I go to LA for networking, I’m alone. Fortunately, many artists are introverts, so I’m in good company. Again, I arrive early, which helps a lot. Do I spend time on the phone? Oh yeah, but I’m working on it. Mostly I’m guilty of doing it with my hubby. Yes, I have to admit to sitting in the car driving cross country with my him doing this very thing. He didn’t like it. Since then, unless I’m checking directions, I do my best to keep him engaged. After all, what if he falls asleep and I don’t notice and there we go, veering off the highway into a ditch or maybe into a semi? It could happen. Preoccupation with the phone is something I try not to do while with others. It’s rude and hurtful. When someone does it to me, it just tells me they’d rather be on their phone than in my presence and quite frankly, if that’s the case then… Ba, BYE! More and more I’m working up the nerve to just tell someone that’s how it feels. Come on give them some credit! Maybe they’re researching the artist? Pictures courtesy of dreamstime.com, the web and personal. I can’t see most of the images but it is sad how technology steels away face to face interaction these days. 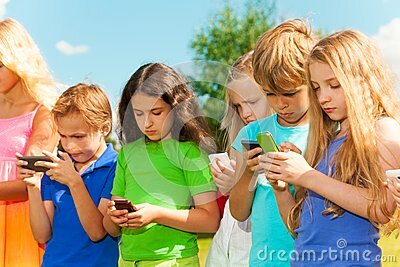 Each of my 4 kids interact well with their peers and adults and know it’s disrespectful to be on their phones around others. I’ve tried to set an example by not using my phone in line to check out at stores so I can give the clerk my full attention (except if I have a coupon on my phone). Sometimes I admit to using it as a clutch when I’m in an unfamiliar place without anyone to talk to, but I do love to people watch so that helps me put my phone away and sometimes I get brave enough to strike up a conversation with the stranger sitting next to me. Sorry the photos didn’t show. Tell me if the pictures came through this time please. Yup, they came through! Great post! Yep! I see pictures. Great post! A sad reality. People “hide” behind their smartphones when uncomfortable or bored. They get so into it, that it becomes important to the extent that it falls within the category of an obsessive compulsive behaviour. …and by that time they all need therapy from a real person: face-to-face! You are right, your pictures show it, the behaviour is seen across cultures and across generations…. Did you ever use public transit and look around you…there is hardly anyone without having their face into their phone! I saw it is Beijing and in Cape Town and of course here. My daughter said that University students bump into each other as no one looks where they are going! And what the heck is so important on Facebook, Instagram, Pinterest? It certainly beats me! Oh and I almost forgot…we have an app for that! I got out of LinkedIn when I saw that it became a social media thing. I hated that compulsory endorsing of people you do not even know! It definitely defeated its purpose. Not wanting to generalise, but the most lies on resumes posted you find on LinkedIn! Bah Humbug…I am with Einstein! This is a completely new kind of generation coming up. It is kind of sad, especially the wedding photo. They should be looking at each other and all around at their guests and remembering the day. I remember once taking lots of pictures on a vacation. I stopped and thought to myself that I should look around and enjoy and store these memories in my mind more. Taking pics can actually cause you to miss something! When I think back to my youth, I can close my eyes and see the neighborhoods and cities I grew up in. I can see the mountains in the background and the deserts we would go visit. I wonder how much young people will remember of their youth in mental pictures. If they are always looking at their phones, they will miss a lot. My daughter’s folklore professor said the problem is that technology is still so new that people do not understand how to properly use it around others. We have not created etiquette for it. She tells her students to act as if their phones are magazines. If you engage in a conversation where you would naturally share something from a magazine (or newspaper), such as a fashion trend, than using your phone would make sense. Otherwise, the phone should be put away as the conversation wouldn’t involve the “magazine”. Does that make any sense? Good to hear an educator educating youngsters on phone etiquette. However, remember (you may not be old enough) when young people would tie up their family’s phone lines for hours. It was not uncommon in the 50’s,60’s, & early 70’s. It’s all perspective. and now I saw on snopes.com that the quote is not from Einstein, but that makes the message no less valid. Excellent post and very true. I’m not one to get too attached to my phone, tbh, but it often seems like everyone around me is. It’s very strange to me. Actually I can yodel decently. LOL I always thought it was cool and would practice with Gene Autry. Yes, I’m that old. I was just talking about this same subject to my son last night. Thank you for sharing. I can go on their journey with them in my mind..
Technology should foster not hinder human interaction. We need posts like yours to remind us from time to time, lest we get carried away. Thanks. I go for the dog. I have done many things that landed me in the spotlight. I am not shy in the slightest. But, I still go for the dog.